Don’t we all love a pattern that fits perfectly and can be modified in multiple ways. I created this gown for a client last year. The dress worked so well she requested more variations. This one was done with French ribbon lace and a full circle skirt of silk tulle. For the second version I fashioned the bodice from an Oscar de la Renta guipure lace and paired it with silk velvet A-line skirt. 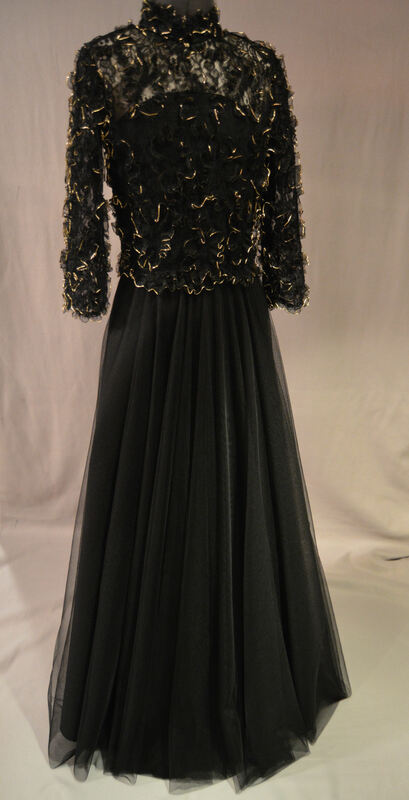 The black fox collar and cuffs are vintage and were restyled to fit the gown. The bodice lace (from Mood Fabrics) worked better cut crossgrain as the pattern could be cut attractively at the waist seam. I’ve shown it here running lengthwise. 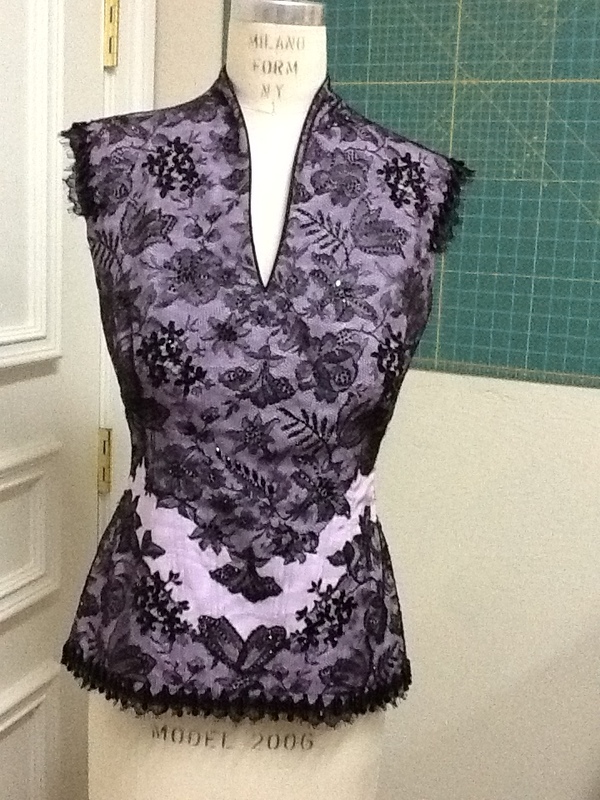 By rotating the bodice pattern 90 degrees, I was able to use the leaf pattern as an edging. 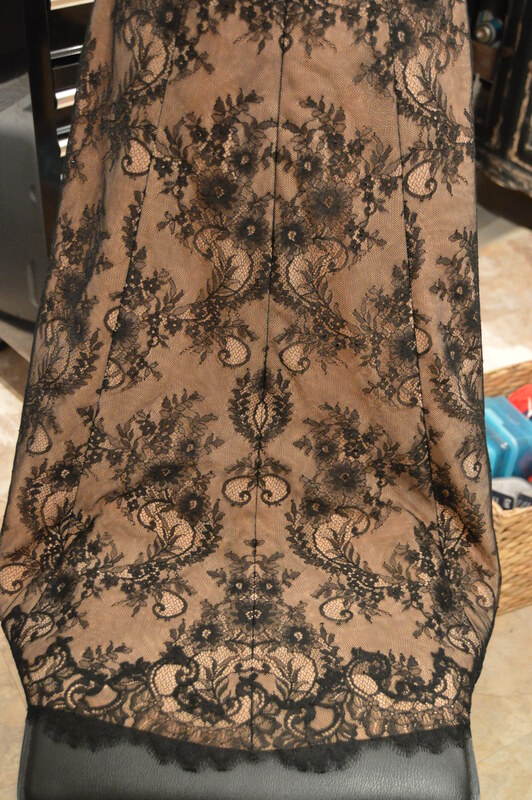 The lace was backed with black silk organza and black silk crepe de chine formed a built in strapless slip. 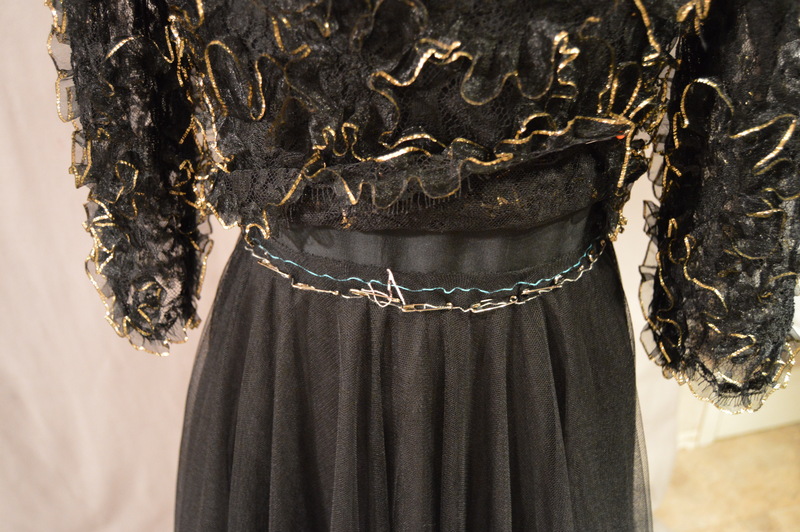 The lace edge was flipped up out of the way, waistline seam sewn and then the edge tacked down to the velvet skirt. 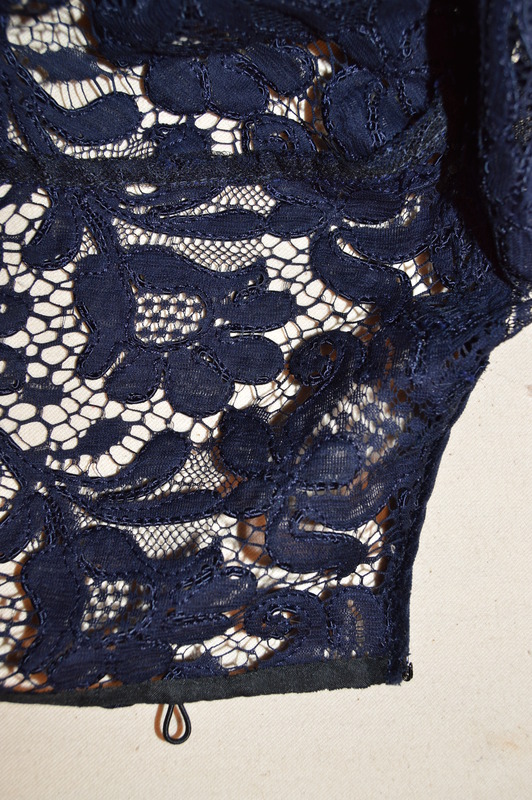 The lace was positioned as not to interfere with the side seam. Silk velvet is tricky to sew and will shift all over the place if you don’t baste. I find diagonal basting holds it firm. Vintage fox collar and cuffs were trimmed to size, backed with grosgrain ribbon, and attached with snaps. I found holding the fur out of the way by placing it at the edge of my work surface saved many frustrating thread tangles. The third version required extending the bodice a few inches below the waist. For this I used a wonderful Armani stretch satin from B&J Fabrics. The lace is from Mood. If you happen to shop for lace in Mood, Carman is wonderful to work with and knows every piece of lace in her department. The skirt is a simple flared shape cut from 4 ply silk crepe. The bodice needed some sort of interfacing and I found Pro Tricot from Fashion Sewing Supply a wonderful product. I was skeptical about fusing a stretch fabric but the interfacing stretches and worked beautifully. I’ve thread traced the seam lines with silk thread. The armhole was cut wider at the shoulder as we were considering an extended shoulder line like a small cap sleeve, but would up just trimming the armhole at the natural shoulder line. 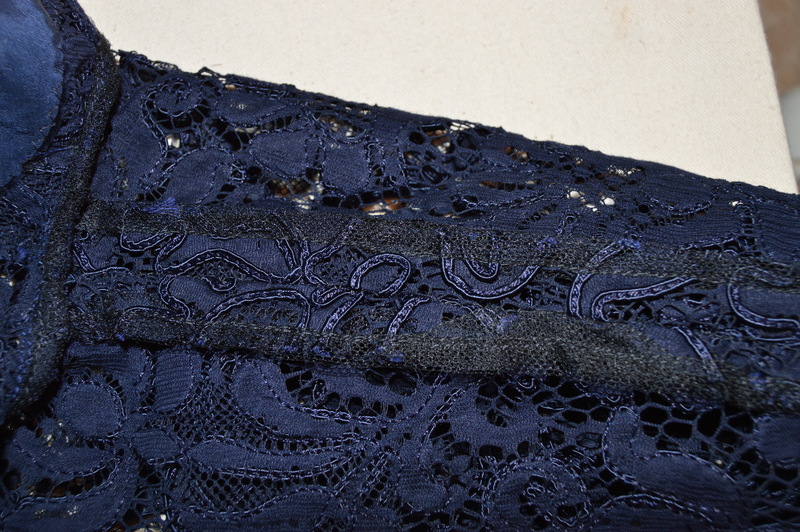 The heavy guipure lace had a shiny finish on the right side. I reminded me of patent leather. 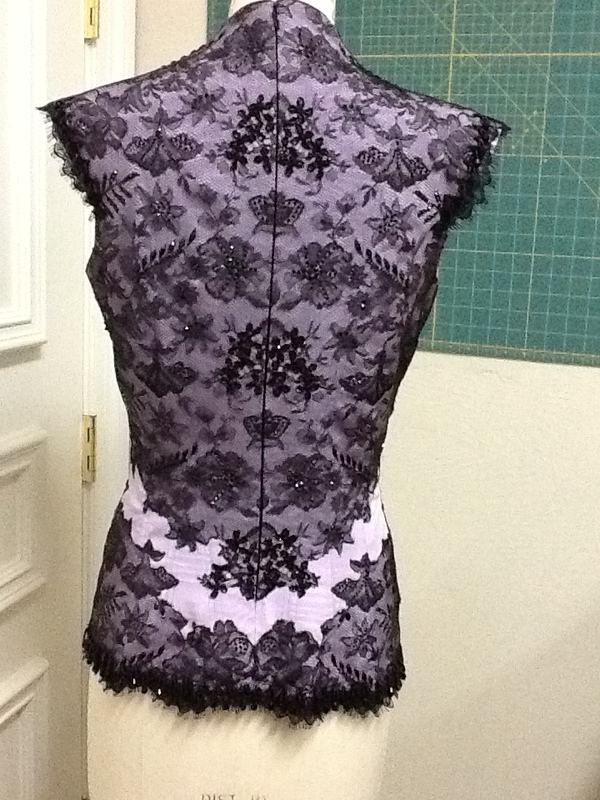 I planned to cut out motifs and arrange them in mirrored pairs on the bodice. 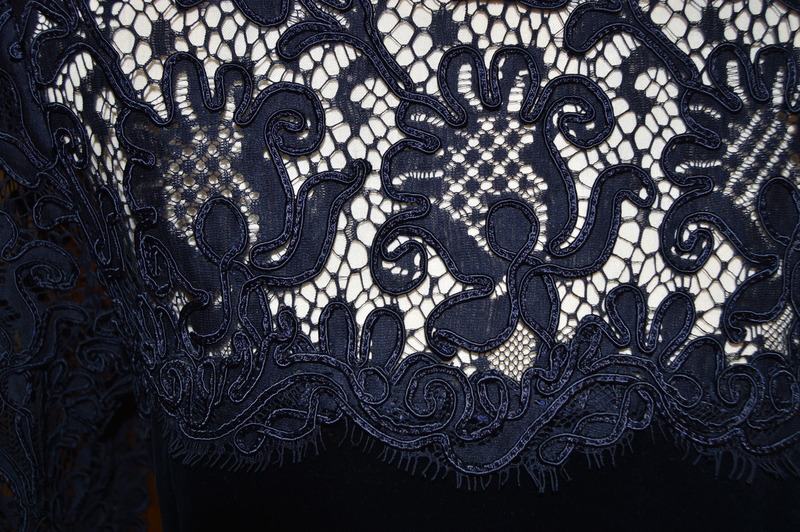 Rather than cut and try to match individual pieces, I arranged the lace right sides together and shifted it around until the pattern on both layers matched. Pin together and then cut out the motifs as matched pairs. I cut varying size and shaped motifs to form the pattern I had in mind. Now for hours of hand sewing as every motif was stitched in place. I made a wonderful pressing tool which is a bag of heavy muslin filled with sand. Press the appliqued sections wrong side up and the lace will sink into the sand and prevent you from pressing the lace flat and damaging the effect. The bottom edge of the bodice faced with silk organza. 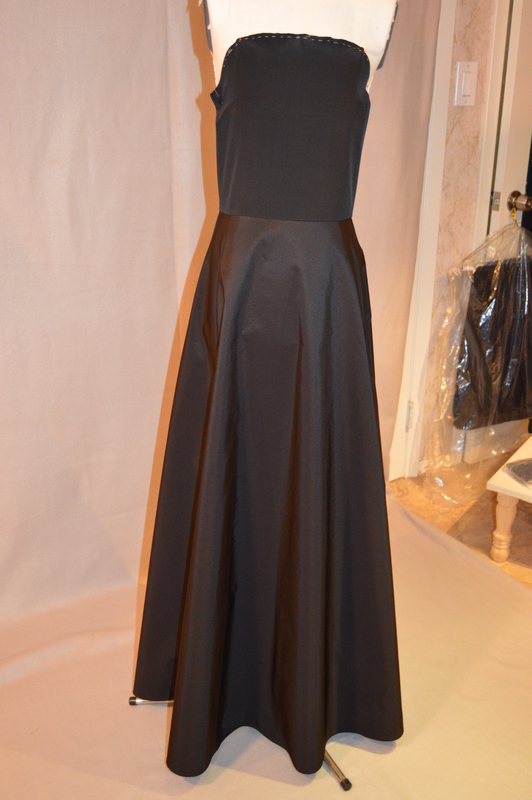 The first fitting on the dress form showed the bodice hem flared out a bit to much; easily corrected at this stage. An invisible zip closed the back. How to insert a white zip into black fabric? I hand sew the zippers as I have much more control that way. Press the coils of the zipper open and sew with a backstitch just inside the zipper coil. Hand stitching allows you to vary the stitch distance from the zipper coil. If you’ve ever sewn a zipper into a garment where the thickness if one section is substantially different from another, you know that the zipper often refuses to jump over the hump. I’ve stitched just slightly further away from the coil at this point to allow the zipper to close smoothly. Notice also I switch from black to white thread. A tiny bit of zipper tape shows but it’s preferable to the zip not closing or breaking. Some might prefer a lapped zipper application, but I like the clean line of an invisible zipper. A ribbon waist stay is added. The white zipper is well concealed. I waited until the zipper was installed before sewing the last bits of lace motifs in place so they would match perfectly at the back. September and October were filled with nonstop sewing and I’m happy to have time now to get back to writing. 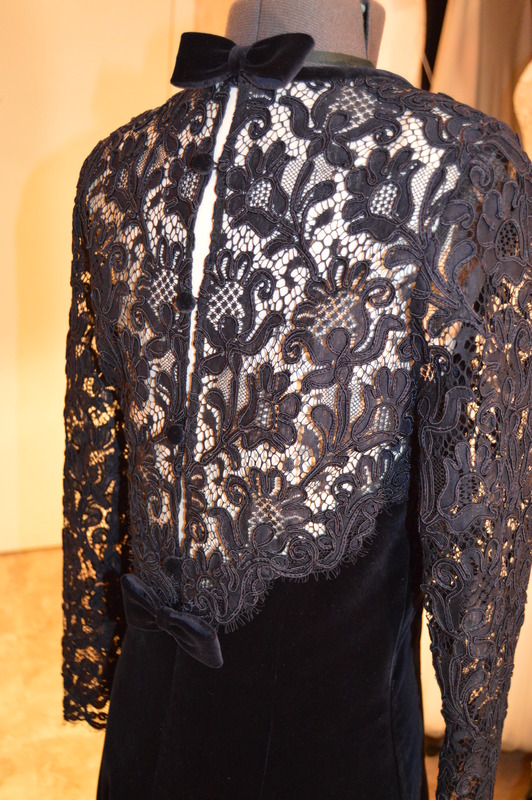 Lace dominated and here is another gown created for the winter ballet and opera season in New York. My client is petite and has difficulty finding evening gowns that don’t overwhelm her slim shape. 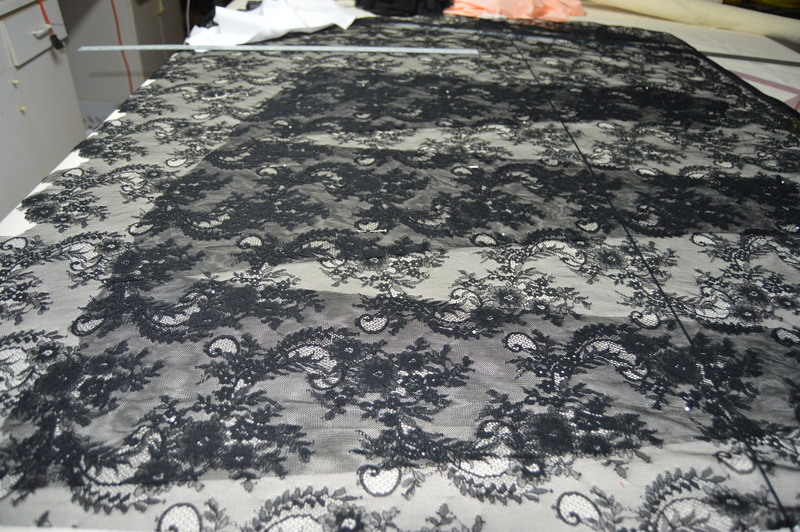 She spied this lace in my studio and we designed a gown to compliment her figure. The underskirt is silk taffeta draped into a half-circle skirt. The pattern was split into thirds; two seams at side fronts and one seam at center back. 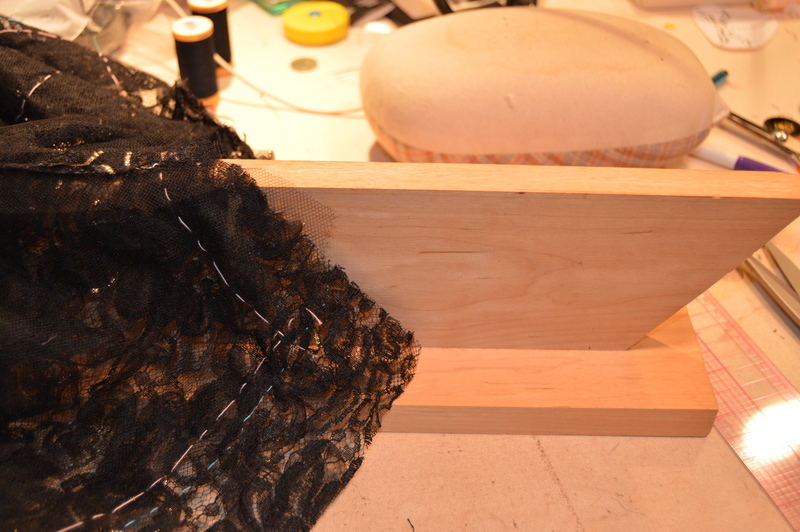 Placing the grain line down the center of the skirt sections caused the skirt to drape evenly all around. The bodice lining and underlining were cut from silk crepe de chine. The underlayers ready for lace and tulle. The bodice is a simple, waist length top, 3/4 length sleeves and opens down the center back. 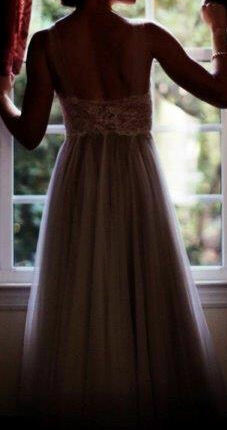 The lace is underlined with silk tulle. Seam lines thread traced with generous seam allowances. The pink thread is the original seam line; the blue is alterations after fitting. Press the seams only within the seam allowance to avoid crushing the ribbon. Trim lace seam allowances only, leaving the silk tulle wide enough to fold over twice and bind the seam edges. The back closes with tiny buttons covered with the silk taffeta and elastic button looping. 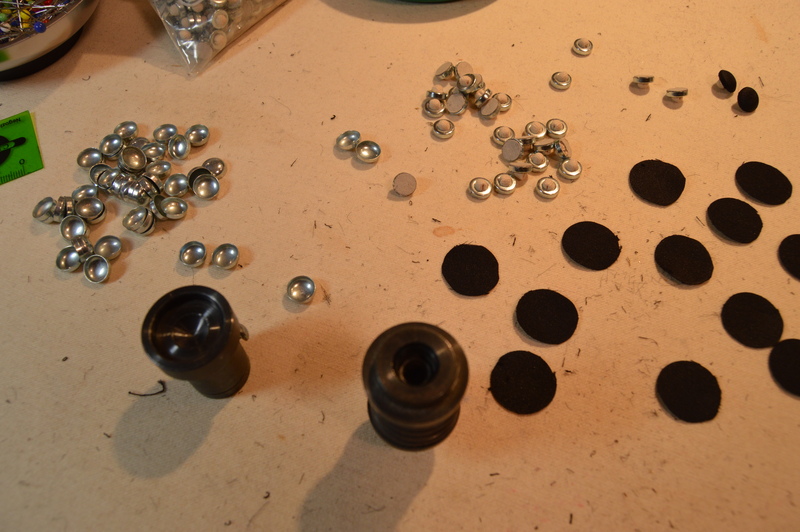 I use size 16 tufted-back button blanks and a Handy button press. A narrow stand-up collar finishes the neck edge. The collar is crepe de chine and interfaced with medium weight iron-on weft interfacing. I wanted to use the scalloped lace edge along the top but felt the scallops were too deep and extended too high along the neck. Problem solved by hand gathering the scallop tops to create a less pronounced curve. 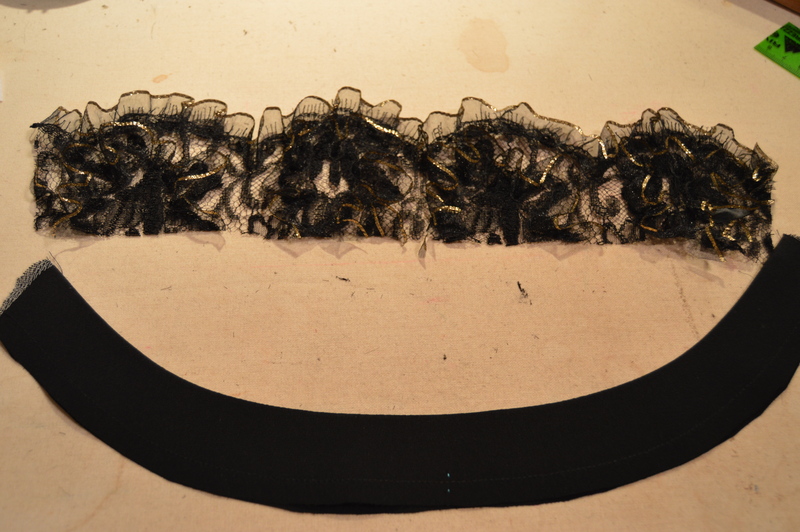 The lace edge was then steamed to follow collar curve. Completed lace collar is tacked on from the wrong side. Looks good but I felt the neckline seam needed a little camouflage. A common technique in couture is to deconstruct and manipulate the fabric. 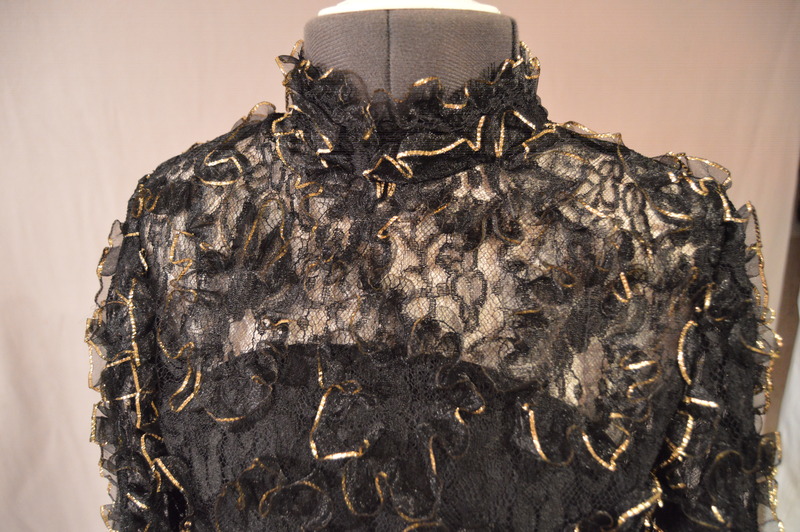 I removed a long length of the ribbon from the lace, hand gathered the edges together to create a double sided band, and applied it over the neckline seam. Here is a closeup of the additional ribbon along the seam. Next was the tulle skirt. I used a soft finish silk tulle which would drape better than the stiffer version. Fortunately this stuff is available in extra wide widths so the skirt could be cut with only side seams. Using a circular skirt would also give fullness at the hem and allow the waistline to have a slimmer look. I felt a full, gathered skirt would overwhelm this figure. This is the same design technique used for a bridal gown skirt, also for a slim, petite figure. I cut four circles of silk tulle 98 inches in diameter. An inner circle with a diameter of about 4.25 inches created the waist seam. Two circles sewn together at the sides created the top tulle layer; the other two circles were for the under layer of tulle. Slit both layers along the center back for the zipper opening. Baste the two layers of tulle together along the top edge. I had calculated the finished length of the gown before cutting but needed to allow for final tweaking of the length. The length was adjusted by raising the waistline seam, NOT recutting the bottom edge which would have been over 12 yards and taken forever! Notice I use safety pins for fitting to avoid snagging the delicate fabrics while getting the garment on and off. The tulle is hand sewn to the base layer; lace bodice flipped down and tacked and bodice lining tacked along side seams and upper edges. I’ve been doing loads of work on laces recently. 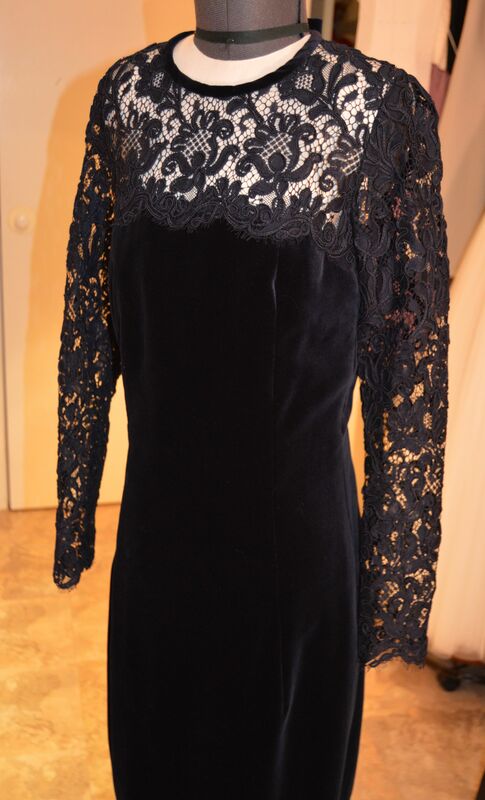 Here is the latest project: a navy cotton velveteen dress with the upper bodice and sleeves made in a soutache re-embroidered lace. Front and back views. An invisible zip closes the skirt and tiny self covered buttons with looping close the lace at center back. The bows snap on, concealing the zip stop and finishing the back neckline. 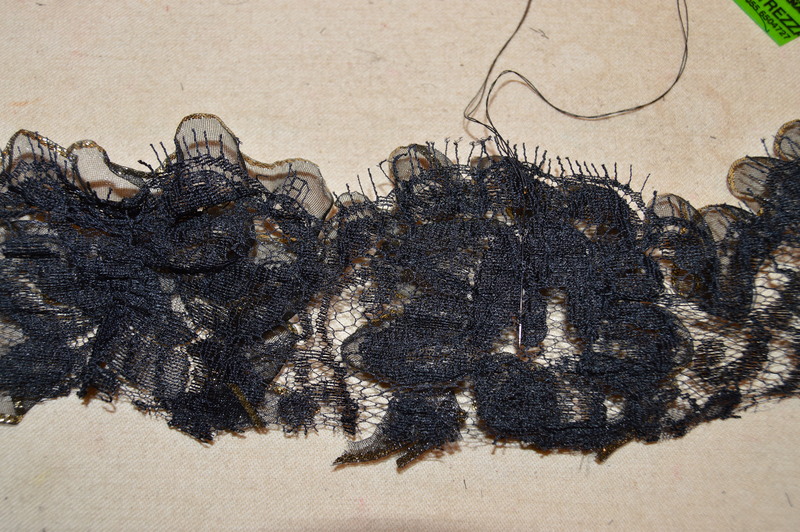 This project was a virtual sampler of lace seaming methods and edge finishes. The neck edge is bound with a bias strip of velveteen. The center back lace edges are turned under and finished with a narrow strip of lengthwise silk organza to prevent stretching. Here is the wrong side showing bias binding and organza edge with elastic button looping. The sleeves were cut with the scalloped lace edge as the hem. 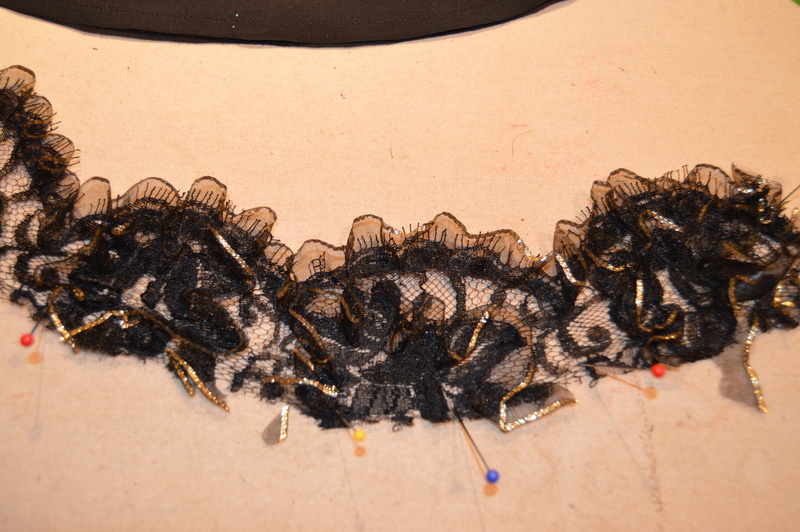 This lace was fairly stiff and the soutache cording added thickness. 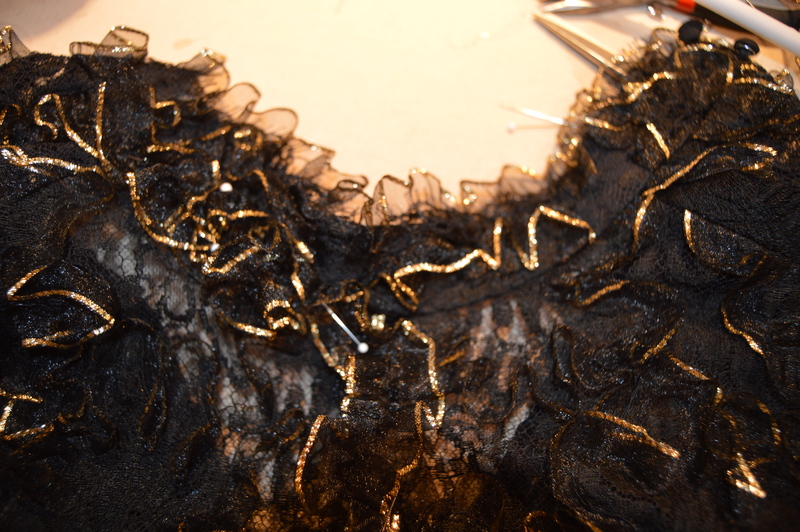 I used a plain seam to close the underarm sleeve seam, trimmed the seams to 1/2 inch width and bound with silk tulle. 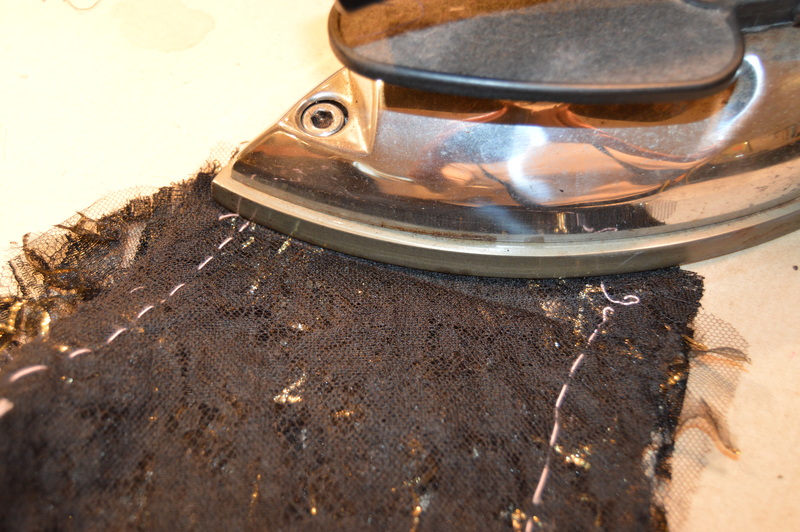 Loads of steam and a tailors clapper were necessary to get this seam flat. 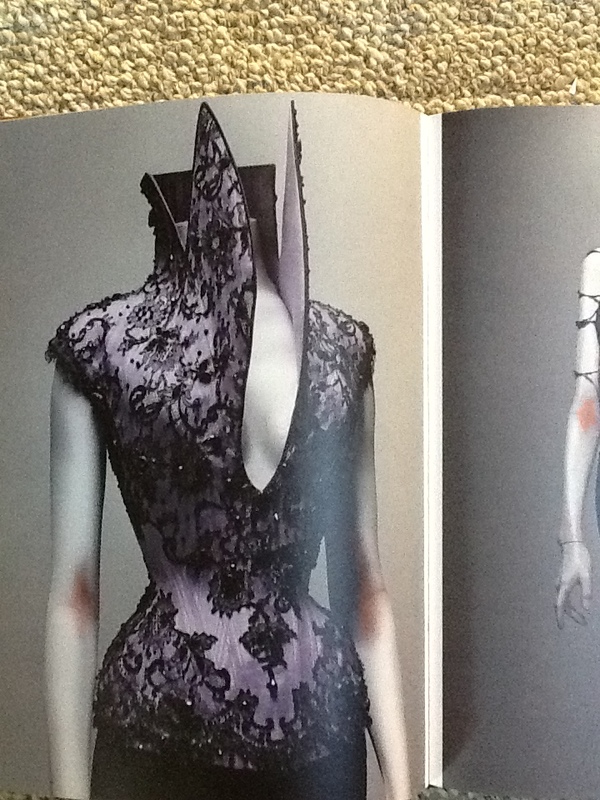 The armseye seam was trimmed, bound with silk tulle, and pressed towards the sleeve. 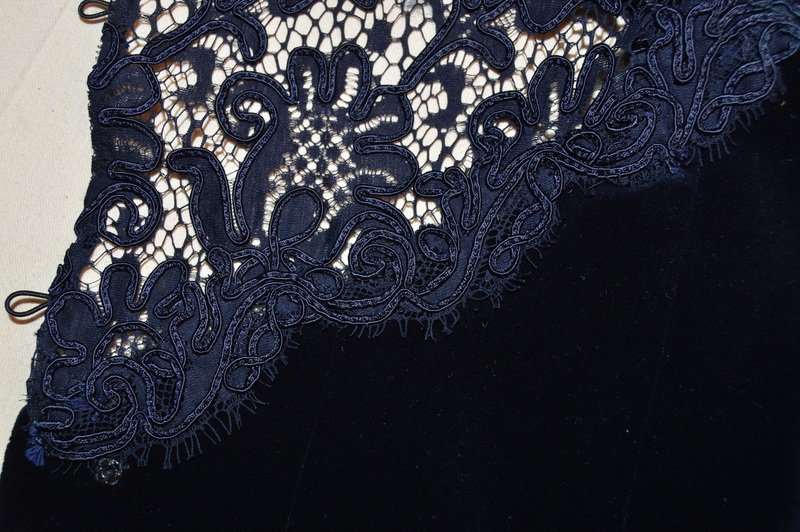 This lace was designed so that edging could be cut without cutting through any soutache cording. The cording frayed badly, so cutting through it and leaving it exposed wasn’t an option. 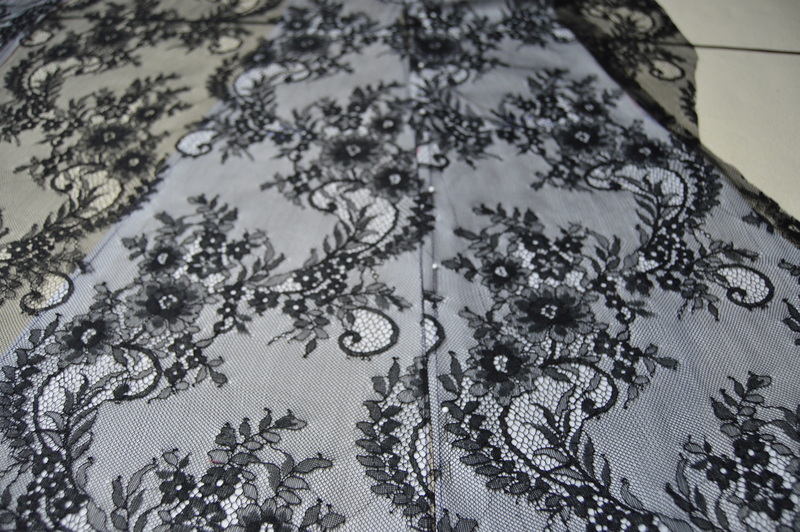 The lace edging was hand appliqued along the seam joining the bodice and skirt. Sewing by hand with tiny applique stitches leaves no trace of the join. 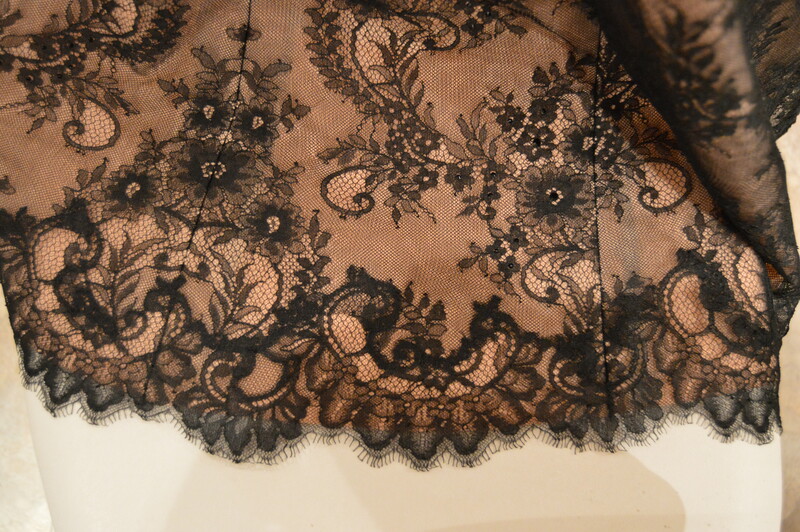 Another view of the lace. Also, I overlapped the shoulder seams and cut the lace front and back as one piece to eliminate a shoulder seam which would have detracted from the lace pattern. Loads of options for lace seams. Every lace is different and may require multiple techniques to produce the look you want. This strapless cocktail dress presented some interesting construction and layout techniques unique to lace. The hem is lower in the back and so the usual way of laying out a skirt with the hem following the finished lace edge doesn’t work here. Also the neckline is edged with a scalloped border. The right and left sides are mirror imaged. Picky details but never seen outside of couture workmanship. 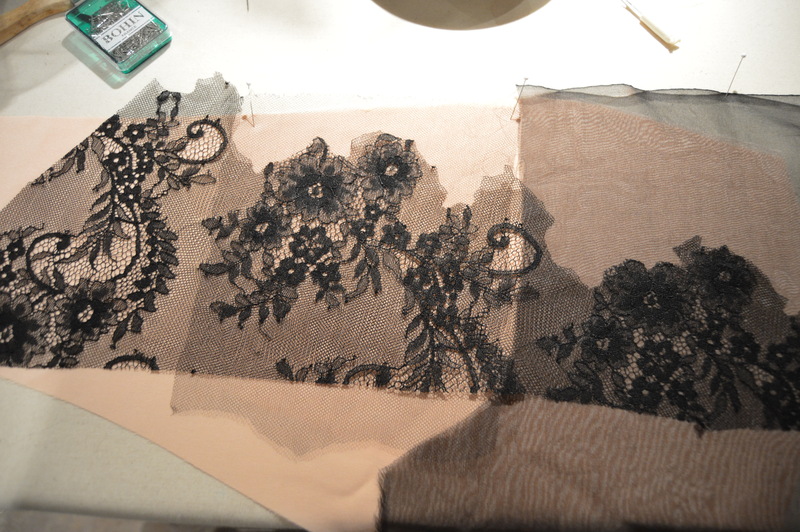 I start a project like this by studying the lace pattern carefully and noting where and how the motifs repeat. 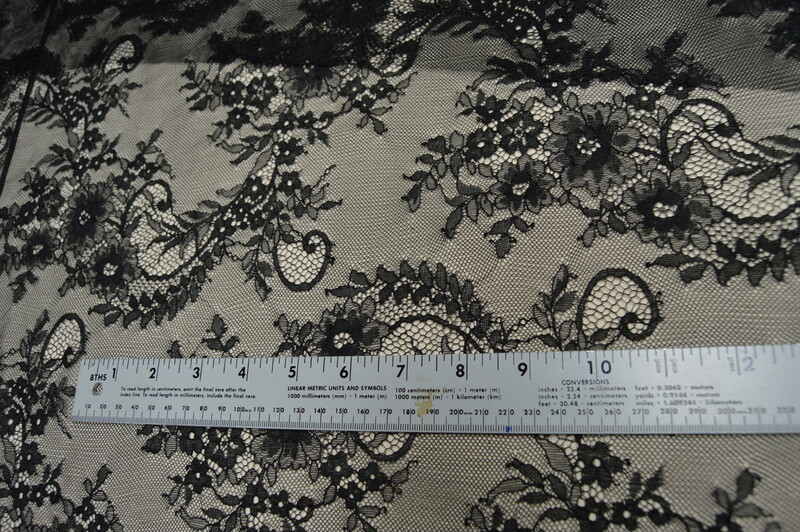 This lace is a fine French Chantilly with a double galloon edge, meaning there are scallops on both edges. 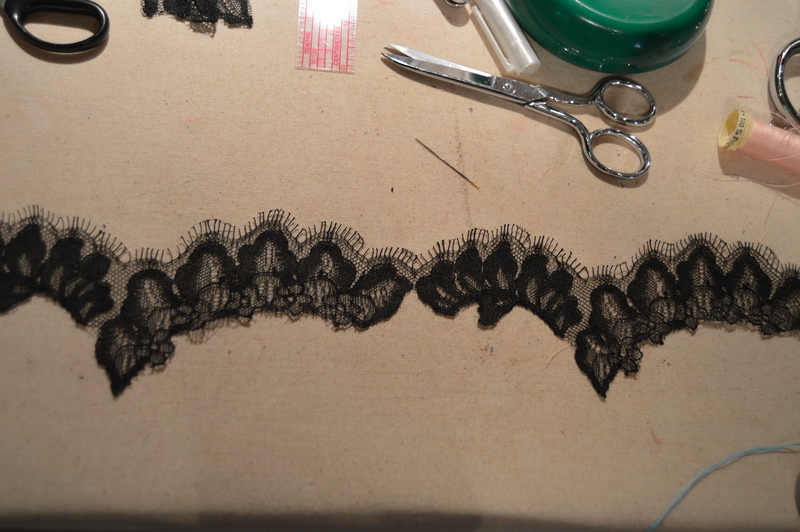 The lace is laid out with a scalloped edge running the length of my long cutting table. This shows the pattern repeating vertically every 11 inches. Note the top of the swirl at the end of the ruler and again at the 11 inch mark. Also notice that the same swirl is reversed at 5.5 inches. If you’ve ever worked with upholstery/drapery fabrics you’re familiar with the term “half drop match.” The pattern repeats in some form halfway between the full match. Starting with the corrected toile, position the front piece at the far right hand edge with the hem along the scalloped edge. You will have already determined the finished length. I also trimmed the scalloped edge along the entire length, cutting around the motifs. Since back hem was longer than the front, the other pattern sections were moved upwards a full pattern repeat. The waistline was used as a reference point and was also positioned parallel to the lower edge. Now for the interesting part. At the half drop line (halfway between pattern repeats) the pattern mirror imaged. On this diagram I’ve illustrated this with red C’s. Notice how the C’s flip. The easiest way to get perfect matching is to cut the left (or right side) first, flip the lace piece and lay it down matching the pattern motifs. My muslin toile is folded or cut along the seam line, so matching is easy. 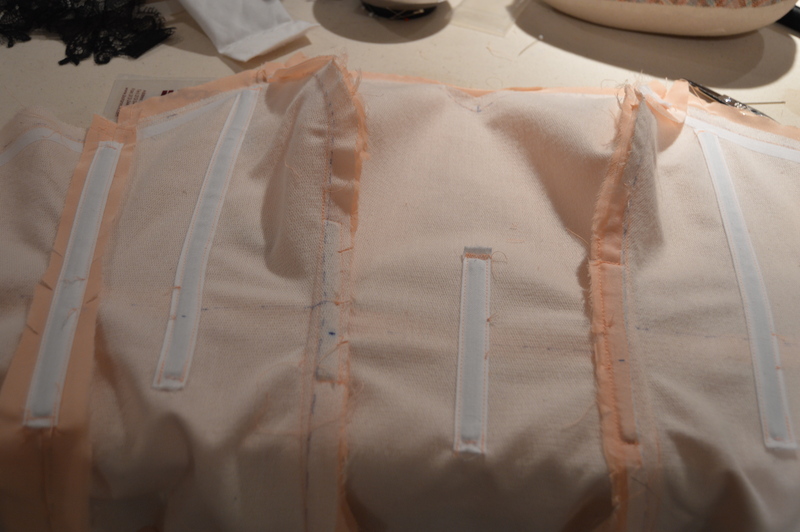 I fold the seam allowances under and check that the seam doesn’t fall along an unwanted pattern placement. Here I will shift the piece over to avoid a prominent double “fern leaf like pattern” along the seam line. The dress is constructed of silk crepe de chine with silk organza underlining. The lace is backed with a layer of silk tulle. That means the dress has four layers: Chantilly lace, silk tulle, crepe de chine and silk organza. 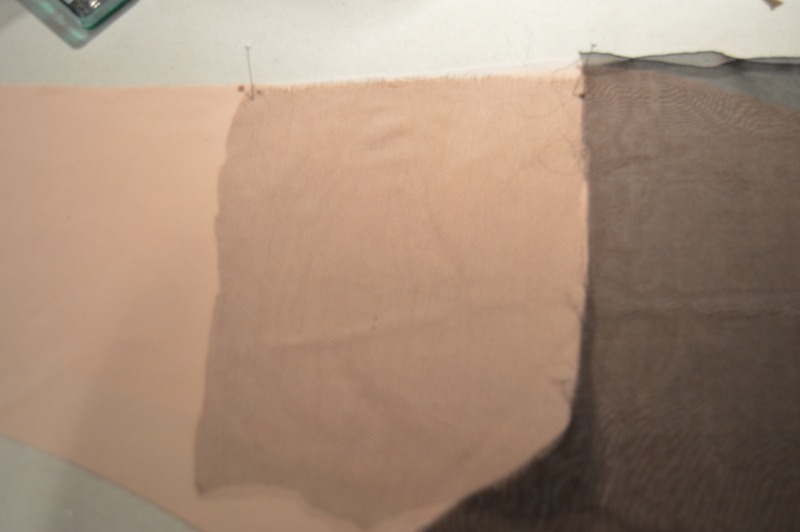 They are basted together, seams lines thread traced, and then treated as one layer. 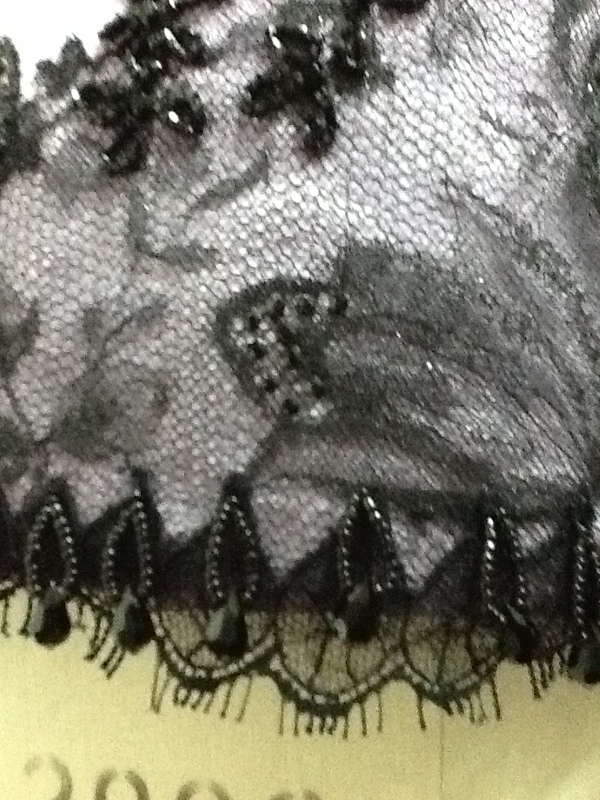 I frequently use silk tulle as backing for lace. It’s wonderful to work with and almost adheres itself to the lace. 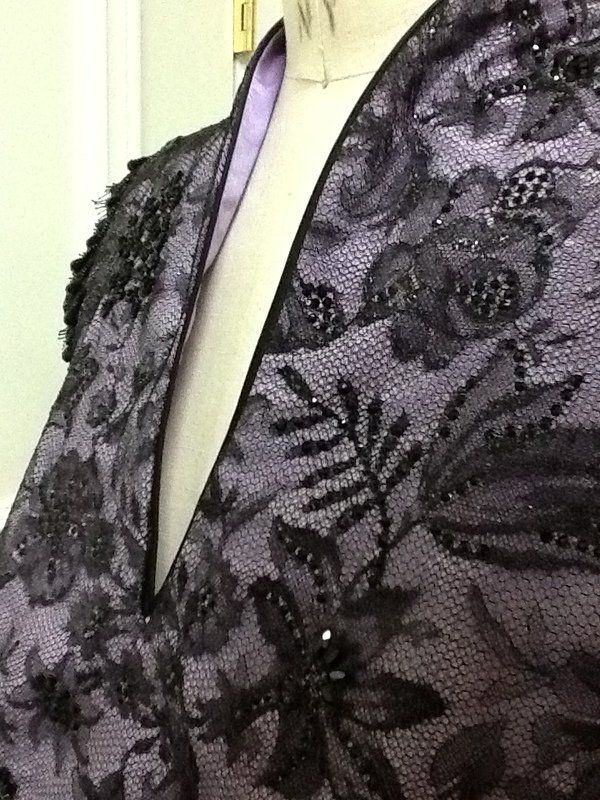 I think it softens the contrast between the lace and silk underlayers. 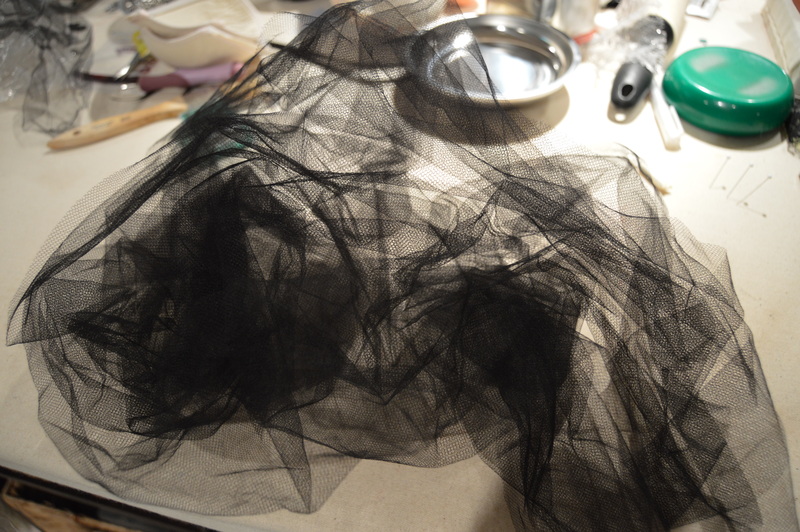 Silk tulle comes in black, white and ivory but I’ve successfully dyed it when needed. Nylon tulle is NOT the same. Unlike silk tulle, the nylon version fights you all the way. It doesn’t behave and insists on doing its own thing. 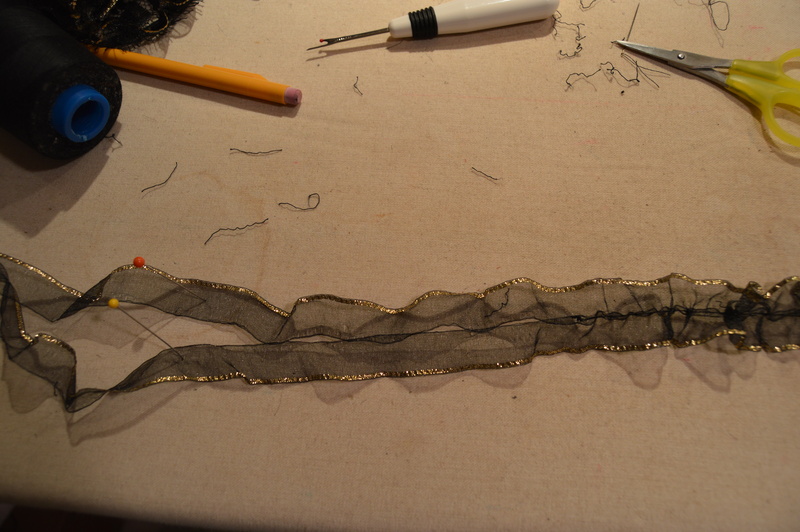 Some advocate using silk organza as backing for lace, but I find it too opaque and doesn’t produce the effect I want. Here is the Chantilly lace with no underlay, silk tulle, and organza. Try different materials under your lace and see which produces the effect you like. Sew major seams through all layers. I hem the crepe de chine/organza layer before finishing the seams. 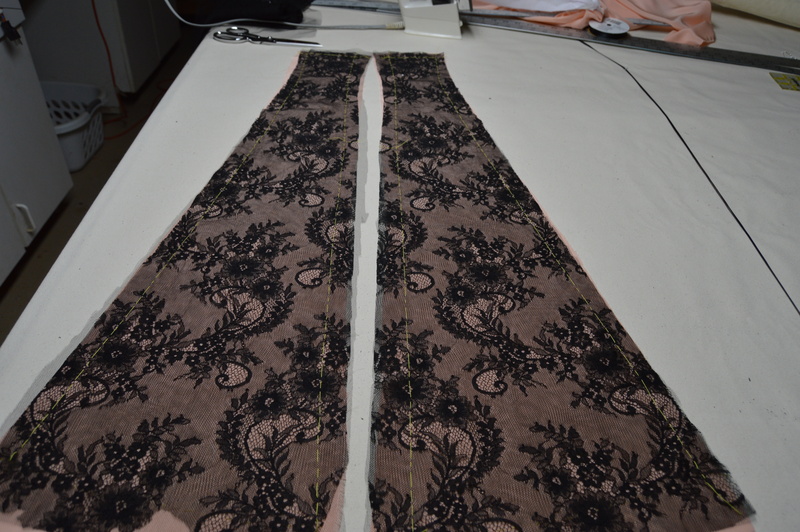 Working with only the lace layer, hand applique the hem border following the motifs. I found silk thread blended in best. 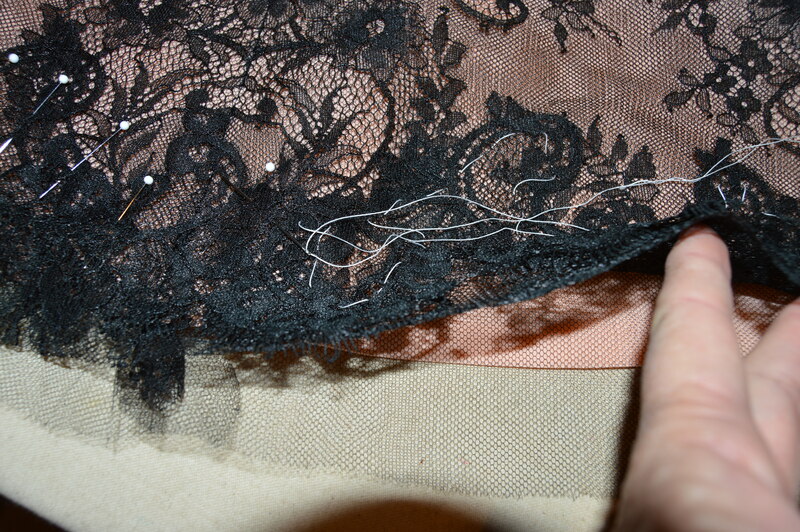 Trim away the excess lace underneath the appliqued edge and tack it to the silk tulle. The neckline trim is done the same way except trim closer to the scallops so the trim is narrower and follows the shaped edge easier. The lining is the same crepe de chine. 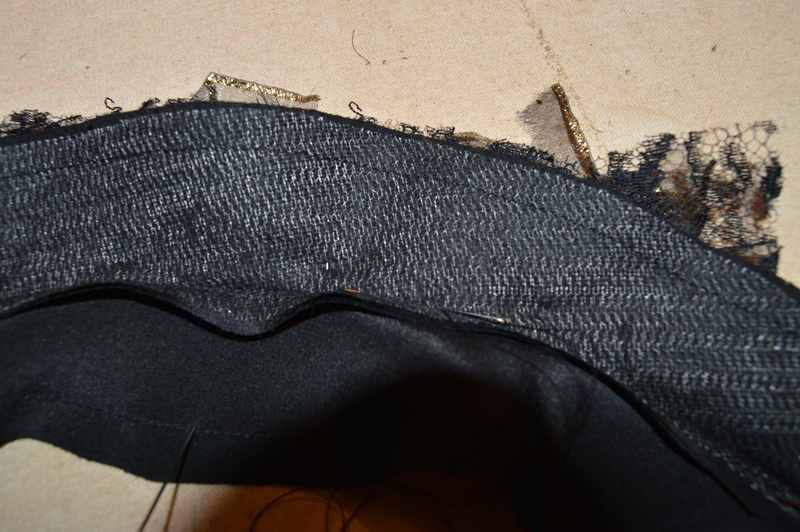 I fused a high quality weft interfacing to the hip line and added boning for support. This will be worn over a foundation garment, so heavy boning wasn’t needed. A ribbon waistband keeps the dress in place and prevents it from slipping down. Perfectly matched seam with invisible zip. 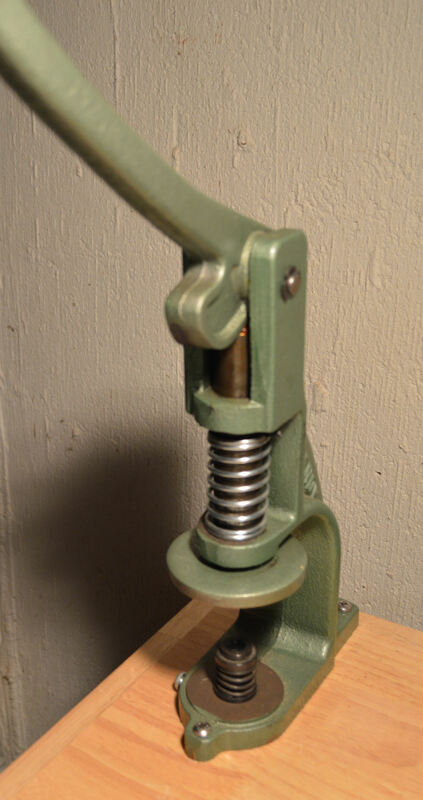 If you noticed at the beginning of this post, the photo of the front neck shows the center front as about 3/8 inch off center. This was done to correct for one hip being lower than the other. The toile had a definite right and left side. The pattern pieces are shaped differently but the garment looks symmetrical when worn. The dress form was wearing bust pads and a spandex tank; explains the strange undergarments.